In 4-quart saucepan or Dutch oven, place potatoes. 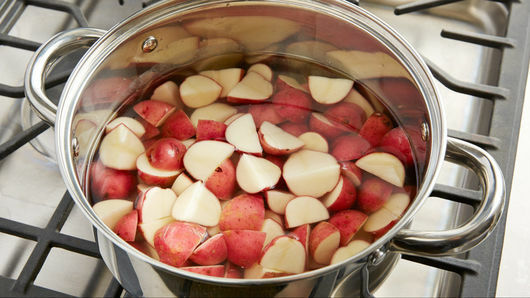 Add water to cover potatoes. Salt water generously. Heat to boiling; reduce heat. Cook potatoes about 15 minutes or until tender when pierced with a fork; drain. Meanwhile, in 10-inch skillet, cook bacon until crisp. Remove bacon from skillet with slotted spoon; drain on paper towels. Set aside. 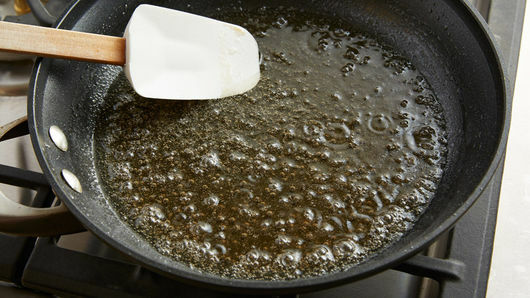 Add vinegar, oil, sugar, 1/4 teaspoon of the salt and the pepper to bacon drippings. Cook over low heat 1 to 2 minutes, stirring constantly, until sugar is dissolved. Be sure to use new potatoes instead of baking potatoes. New potatoes contain more starch than baking potatoes and hold their shape better when cooked and tossed with other ingredients. Serve this potato salad at any picnic with grilled bratwurst. What makes it a “German” potato salad, anyway? 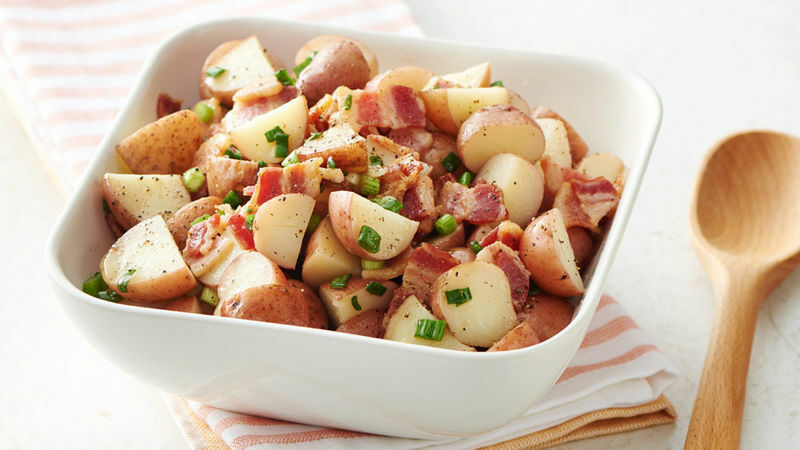 Well, potato salad actually originated in Germany and was later adopted and adapted in the United States as a must-have side dish for summertime. 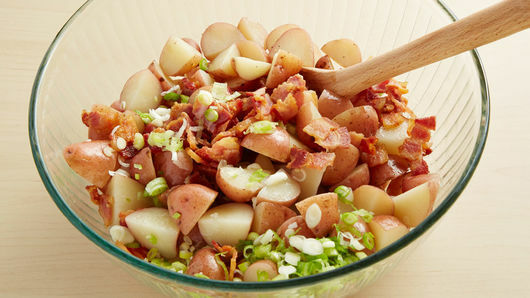 In fact, just about every picnic, potluck and grill-out has some form of potato salad served as an accompaniment to the main dish. In the U.S., we think of classic potato salad as the mayo-based version that’s cold and creamy, but originally it was a vinegar-based salad served warm, which is what is known as German Potato Salad. You could serve either versions of potato salad and win rave reviews at your potluck, or you could serve another one of our party-ready salads.